The required pace of change in today’s organizations demands innovation more than ever before, yet innovation is only one of four sources of organization energy that can accelerate successful change. Organizations of all sizes share a common life cycle, comprising phases of initiation, growth, maturity and decline with possible eventual renewal and a new initiation phase. This life cycle process may be mapped over time along an S-shaped growth curve where innovation represents just one contribution along the journey. Importantly, for an organization to thrive in the long run, it must successfully make the leap onto a new growth curve before reaching the end of its decline phase. Movement among the phases of the growth curve requires energy which I call Organization Energy. Organization Energy comes in several forms, and people are energized in different ways. Employers need energy in the right place to maximize their current strategy, and employees want to be in roles where they deploy their natural preferences most powerfully. When strategy and strengths are aligned, talent retention improves, and potential is actualized. While it is well known that the right mix of culture and capable employees are required for progress, not much has been said about energy potential for productive change. What if you could identify untapped resources already within your organization? The AEM-Cube is a cybernetic, ethology-based tool that does precisely that. It measures what drives behavior and unveils “heat maps” that identify where the highest energy potential exists in an organization. Innovation is one of four drivers that, along with awareness and leverage, can ignite improved efficiency, agility, relationships, and use of technology. The heat map below represents data that may be gleaned from the AEM-Cube tool. This illustration is similar to that of a large U.S. engineering company. 80% of employees prefer optimization to innovation. In other words, they get into action by creating efficiencies, refining, stabilizing, and executing existing processes (not by creating, exploring, and innovating). Their employees would naturally shine at Kaizen, Lean Six Sigma, or continuous improvement. 71% of employees exhibit elemental energy, preferring to focus on the product, technology, or content side of the business. They naturally thrive in systems development or product improvement. 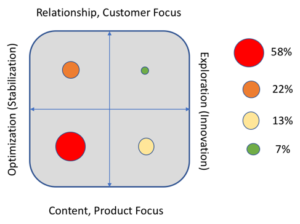 Understanding an organization’s heatmap is the first step to identifying energy potential that is often at best underexploited or at worst ignored completely. For example, employees with all types of energy potential are capable of innovating, but those who naturally prefer exploration will do it more quickly and with less structure. To successfully innovate, the engineering company represented by this heatmap would need a proven process with clearly defined structure, rules, and goals. Preferably, it would also involve product, technologies or systems development as the topics around which to focus ideation efforts. The AEM-Cube further links two of the four types of energy potential to the growth curve, making it possible to engage individual strengths in tandem with corporate strategy. Depending on where your organization, product or service sits along the growth curve, it may need innovation or stability. Every person is energized by some degree of innovation (exploration and change) or optimization (scaling and stability). 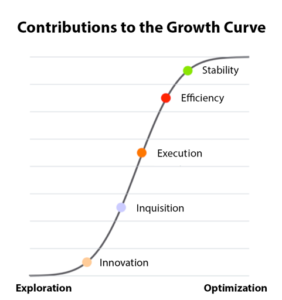 If your organization is at the mature part of the growth curve, then execution, efficiency and stability would be highly valued attributes. Programs like Kaizen, Lean Six Sigma, and continuous improvement are most important in maximizing the profitability in those environments. Companies looking to leap onto a new growth curve, with a contemporary product, service, or market, need employees and leaders who are energized by exploration, innovation, inquisition and execution. Focusing on either extreme of the growth curve alone, however, leaves untapped potential on the table. As an international speaker and advisor on innovation, as well as a Certified Energy Manager through the Association of Energy Engineers, it became more obvious to me over time and with exposure to hundreds of thousands of clients, customers, and leaders, that energy is the source of all mega-trend management movements like: Kaizen, Lean Six Sigma, Design Thinking, Agile Teams, and countless others. Identifying organizational energy preferences, and igniting its potential, leads to a better understanding of how to engage employees most powerfully and ultimately, increased profitability. As former CEO of Military Assistance Company, and SVP Innovation & Sustainability at global companies Balfour Beatty Investments and Actus Lend Lease, Tabitha leverages years of successful experience with innovation program leadership, leader development, and powering organizational potential. She is also an energy expert, as a credentialed Certified Energy Manager®, Certified Demand Side Manager®, and is responsible for implementation of the world’s largest rooftop solar community. While helping dozens of companies become more agile, Tabitha is an international advisor and speaker on energy, change management and innovation, with several published works.